OST File Repair Tool is a Solitary Solution to Repair Corrupt OST File! OST File Repair Tool is the most reliable and impeccable tool to repair OST files. Reasons behind the corruption and damaged of OST file such as bad sector in hard drive data storage, suddenly stops MS Outlook, viruses and malicious effect, networking issues in Exchange Server, synchronization error between Exchange Server and Outlook. This OST Recovery tool can carry out Microsoft OST repair process from all the critical situations. It can retrieve OST emails with all the portions like mailbox, contacts, journals, tasks, notes, calendar entries and much more. 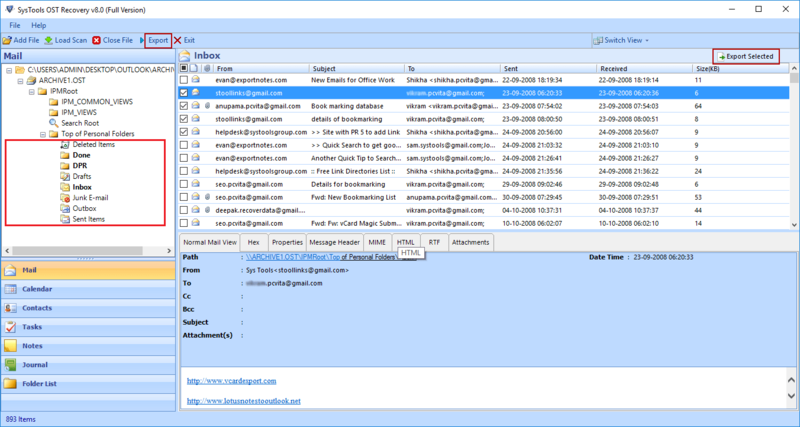 This Software can repair OST files Outlook with accurate fields and details i.e. it repairs all the elements with their actual fields and details like information of sender and receiver, subject of the email, cc and bcc of message, date and time and many more. Recover corrupted OST files in few special formats i.e. OST as PST, OST as MSG, OST as HTML, and OST as EML and the converted PST file will support all the editions of MS Outlook. You can easily justify the performance, functions and qualities of this program with a value determining version of the OST file repair software. How Does it Retrieve OST Mailbox Database? This is a free version of OST file repair software and by downloading this free version, you can examine the performance and quality of the fully functional version. This free version provides you the view of the recovery process and the preview of recovered OST database but, it restricts the saving of OST file. After justifying the performance, functions and qualities of the software, you can purchase the fully functional version of the software to experience the qualitative recovery of OST file. 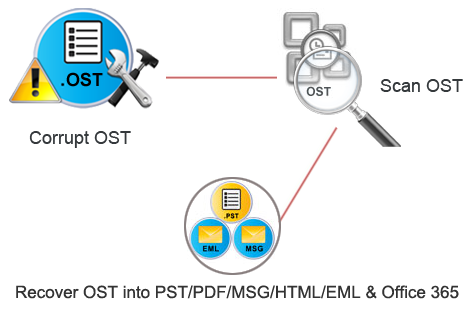 As shown in figure the process of OST Recovery with convert into multiple formats like PST/MSG/HTML/EML. Fully functional version performs all possible qualitative functions related to repair corrupt OST mailbox database and recovery of OST file. This Fix OST files software runs fluently in all the versions of Windows and it performs recovery of OST files from all the editions of Outlook. Support(24x7) : OST file Repair tool is enriched with all these advanced features which are necessary to provide qualitative conversion result but, if you still experience any concerns relevant to working on software. Buy OST repair software and tools activation key or any other query then, you can contact our support team to get an effective solution of your queries.